Area 880 A. 3 R. 25 P.
Hanna Doherty Andrew Phew Private dwelling with 2 rooms. James Kevil James Kevil Private dwelling with 3 rooms. Bridget Kevil Bridget Kevil Private dwelling with 2 rooms. Andrew Phew Andrew Phew Private dwelling with 3 rooms. George Ward George Ward Private dwelling with 4 rooms. Michael Connor Michael Connor Private dwelling with 2 rooms. John Naughton John Naughton Private dwelling with 2 rooms. Patrick Hogan Patrick Hagan Private dwelling with 2 rooms. Michael Naughton Michael Naughton Private dwelling with 2 rooms. John Connor John Connor Private dwelling with 2 rooms. William Harte William Harte Private dwelling with 1 rooms. Michael McHale Patrick Biggins Private dwelling with 2 rooms. John Biggins John Biggins Private dwelling with 2 rooms. Catherine Connor Catherine Connor Private dwelling with 2 rooms. James Phew James Phew Private dwelling with 3 rooms. Julia Tigue Julia Tigue Private dwelling with 2 rooms. Mary Naughton Mary Naughton Private dwelling with 2 rooms. Patrick Biggins Patrick Biggins Private dwelling with 2 rooms. Kate Flood Kate Flood Private dwelling with 2 rooms. Mary Hogan Mary Hagan Private dwelling with 2 rooms. Margaret Kyne Margaret Kyne Private dwelling with 2 rooms. John Haire John Haire Private dwelling with 2 rooms. James Connor James Connor Private dwelling with 2 rooms. Sarah Connor Sarah Connor Private dwelling with 2 rooms. Mary Gannon Mary Gannon Private dwelling with 2 rooms. Michael Gannon Michael Gannon Private dwelling with 2 rooms. Honor Garvey Honor Garvey Private dwelling with 2 rooms. Bridget Henelly Bridget Henelly Private dwelling with 2 rooms. Margaret Henelly Margaret Henelly Private dwelling with 2 rooms. Patrick Garvey Patrick Garvey Private dwelling with 3 rooms. Click on the Griffiths Valuation Page # 162 to see a list of tenants with plot numbers to match the Griffith map. The map has each renters plot numbered and recorded in the Valuation book so the exact location of your ancestors plot can be ascertained. 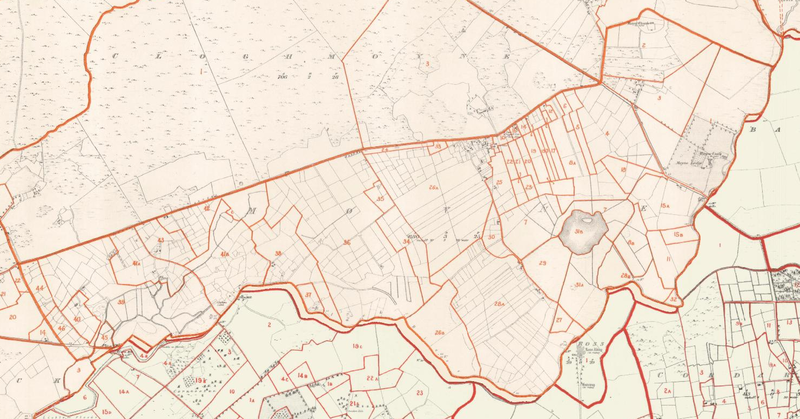 Click on the Griffiths Valuation Ballinrobe Page # 162 to see a list of tenants with plot numbers to match the Griffith map. It is bounded on the N. by the td. of Cloghmoyne; E. by the td. of Toorard; W. by Gortbrack td. ; and S. by the ph. of Killursa, in County Galway. It is the property of Charles Blake, Esq., of Melon Park. It is let on leases of lives and years; in farms of from 3 to 36 acres including bog, at The early rent of ?2 15s. per acre, on average. In the E. of this td. is Moyne Lodge, the seat of Mr. Golden, and adjoining it is the old ruined Castle of Moyne, underneath which passes the river Moyne. In the N,E. side of the td. are the ruins of a church and graveyard, surrounded by a strong, loose stone wall, circular in shape like a fort. At the north side of the td. is a square fort on the road side; its walls are very thick.